Your letter dated 20 March 1960 redirected from my old Qrs. (Vrindaban) is duly in hand and I am very much encouraged to go through the contents which are full of valuable informations. The subject matter discussed in my article under reference is authorised as far as it refers to the conclusion of the Geeta. I may also inform you that my concept of anti-matter is exactly what you all it anti-material. Technically it may be that I could not express the exact word used by the physicist but I have tried to explain the word anti-matter in the light and sense of what you say as anti-material which is spirit. But spirit is not apara as you have pointed out. In the Bhagwat Geeta The Supreme Truth or the Absolute Personality of Godhead is the transcendental purusha and the two energies namely para and apara are emanations from Him. The Apara or the Inferior material energy may consist of may other elements like matter, anti-matter, proton, electron, neutron etc. in terms of physical science but according to the authority of the Bhagwat Geeta -- all of them are produced of the inferior energy called by the name Apara Prakrti. The Apara Prakriti consists of gross and subtle matters like mind, ego and intelligence. Spirit is transcendental to all these. The spiritual energy para Prakriti is simultaneously one and different from the spirit whole. Qualitatively they are one but quantitatively they are different. The Brahman Ray is the effulgence of the Supreme Person. You have defined impersonal Brahman as the Divine Energy. I fully agree with you in pursuance of its description in the Brahma Samhita. I am going to publish in the next issue an article of the name "Variety of Planetary System" in which there is reference from the Brahma Samhita. are unalloyed devotees could recognise Him on the authority of revealed scriptures but others are bewildered under the influence of material energy. The Absolute Truth is therefore the Absolute Person without an equal or high competitor Personality. Impersonal Brahman Rays are the rays of His Body transcendental as much as the sun rays are emanations from the sun planet. According to the Vishnu Puranam the material energy is called Avidya or nescience which is exhibited in the fruitive activities of sense enjoyment. But the living being belongs to the group of anti-material energy or spiritual energy while he has the tendency of being illusioned and trapped by the material energy for sense enjoyment. In this sense the living being is the positive energy whereas the matter is the negative energy. The matter does not develop without being in contact with the superior spiritual or anti-material energy which is directly part and parcel of the spirit Whole. Any way the subject matter of this spiritual energy exhibited by the living being is undoubtedly very complicated thing for an ordinary man. The ordinary man is therefore astounded in the subject. Sometimes he partially understands it through the imperfect senses and sometimes he fails to know it altogether. The best thing is therefore to hear the grave subject matter from the highest authority Sri Krishna or His devotee representative coming down in the chain of disciplic succession. Bhagwat Geeta is the essence of all the Vedas and Upanisads and Vedanta. I am glad to note that you have got the highest estimation for Geeta. I am just trying to present the conclusion of Geeta to the world as it is and without any imperfect compromise with speculative interpretations. We have to learn the lessons of Geeta from the authorised disciplic succession as it is advised there in the book (4th Ch.) Unfortunately every one not in that line tries to explain Geeta in his own way and this process is misguided by the people. We have to counteract this disruptive tendency and put them at right. I shall be very glad if you join my mission (The League of Devotees) and on receipt of your favourable reply I shall send you the prospectus. An erudite scholar like you should join and help in this noble attempt. Your appreciation of India's cultural heritage is very much enlivening for me. 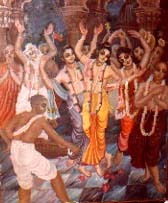 Let us jointly distribute this great cultural heritage to the world at large in an organized manner and through the recommended process of Divine Love propagated by Lord Sri Caitanya Mahaprabhu. Please try to help me as far as possible. Awaiting your reply with interest.